Ferrari joined the rear-engine revolution with the Ferrari 156 "Sharknose". Designed by Ferrari's new designer, Carlo Chiti, the chassis itself was a tubular spaceframe that proved serviceable but could not match the designs of Lotus or BRM. Visually though, the car was beautiful, simple and remarkable at the same time. At the front it features the renowned "sharknose", named because of its distinctive two-fold air inlet. The complete rear end was elegantly covered by bodywork, improving its aerodynamic efficiency. The star of this car however was the 120 degrees V6 engine that was a developed for the new regulations. Because the FIA had equalled F1 and F2 engine regulations by limiting maximum displacement to 1.5 litre, The new engine was designed by Vittorio Jano and Alfredo "Dino" Ferrari. Due to the latter's untimely death, Enzo Ferrari decided to name all 6 cylinder engines "Dino". The angle of the cylinder blocks allowed for the engine to have a lower centre of gravity. Because the engine was substantially wider, its rear placement was deemed necessary. Importantly, except for being dominant in power, the engine was also lighter than the competition, including the Coventry-Climax engine which the British teams were using. While the British teams argued about the necessity of the new formula Ferrari had a brand new car and engine to start the season. The cars first season bore fruit with five victories out of seven races including a 1-2-3-4 finish at Spa. Only tremendous victories at Monaco and the Nurburgring by Stirling Moss could stop the red cars. The World Championship was a battle between Phil Hill and von Tripp and was won by American Phil Hill. His three victories providing the winning margin. Unfortunately the successful season was marred by the tragic death of Hill's teammate, Wolfgang von Tripp and 14 spectators at Monza. 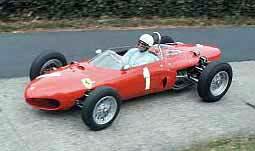 The lack of a competitive engine for the British teams changed in 1962 and Ferrari failed to win a race. Ferrari was also racked by internal politics which resulted in the departure of eight top Ferrari executives including Carlo Chiti. The Ferrari 156 continued to be used for two more years with John Surtees and Lorenzo Bandini scoring single wins in 1963 and 1964 respectively.